Even if you’ve never sold online before, setting up a t-shirt store is easy with our intuitive, all-in-one platform. Customize the look and feel of your site with professionally-designed themes and our powerful site editor. Curate your pages with drag-and-drop content blocks for social media, image galleries, videos and more. 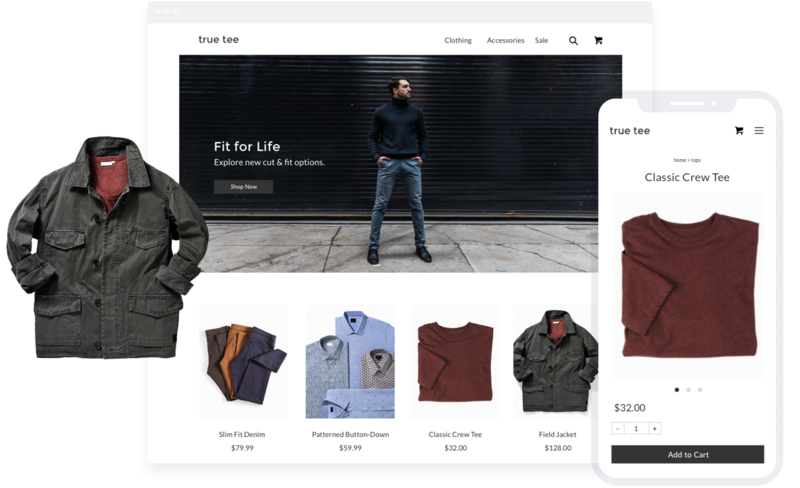 Drag and drop products right into your store and customize your look with endless page options. With built-in integrations like Stripe, PayPal and Apple Pay, you can quickly set up payments. Select from our library of flexible, responsive themes and easily customize your look with the store editor. Find the apps that will take your online presence to the next level. From coupons to dropshipping, we have the tools that you need to grow your business. doing more volume online than we did in our brick and mortar store." Want to learn how Volusion could grow your business? Our team of retail specialists are on hand to help with anything you need.